You can chalk it down as the week in which the nation was set on a course for the next general election. The abrupt and unexpected exit of Independent Communications Minister Denis Naughten on Thursday afternoon was the tin hat on it all. Once the immediate shock of his departure abated, it became clear that we are less likely to see a polling day before Christmas - the question will be how long into the new year can the current strange administration continue? The Taoiseach had no option but to seek the resignation of the likeable and decent Mr Naughten. He had engaged in personal contact with someone bidding for a potentially lucrative national contract and it did not look good. Fianna Fáil has now moved to dampen the prospects of a late November or early December election. The irony is that Finance Minister Paschal Donohoe delivered a politically clever Budget on Tuesday, all elements of which will pass through parliament in due course. However, the Dáil numbers have gone very tight and it could within a short while become very problematic. Bear in mind that this minority hybrid Coalition, led by Fine Gael, propped up by various Independents, and operating by grace of Fianna Fáil, never had a great margin of error in this Dáil of 160 TDs. In the past fortnight Taoiseach Leo Varadkar's Government lost one Fine Gael backbencher, Peter Fitzpatrick, of Louth. It also lost the frequent support of Independent TD for Clare, Dr Michael Harty. As he exited, Mr Naughten said he would consider what future support to give his old Government colleagues "on a case-by-case basis". There would be no great surprise if a rather bruised Mr Naughten became scarcer at Leinster House for a time, recommitting to constituency matters. To get something through the Dáil, the abstention of Fianna Fáil's 44 TDs is required. Then the Government needs to muster a total of 57 TDs. The current Government reading is 54 TDs, comprising 49 Fine Gael deputies, the four Independent Alliance ministers, and Independent Minister Katherine Zappone. They more usually also have Tipperary Independent Michael Lowry, and often have a variety of other Independents to give them quite a cushion. But nothing can be taken for granted when a contentious issue arises - and everything is compounded now that the so-called confidence and supply deal with Fianna Fáil is once again up for grabs. Hence the Taoiseach's arguments, made twice in recent months, that something should be done to secure more stability, maybe even an early election. The opening moves in the two big parties' confidence and supply talks have begun with another episode of "leak that letter". Previously, the Taoiseach sent a chunky missive after a meeting with the Fianna Fáil leader Micheál Martin, and then promptly published it. Yesterday, it fell to Mr Martin to fire off a note, and then circulate it to the media. 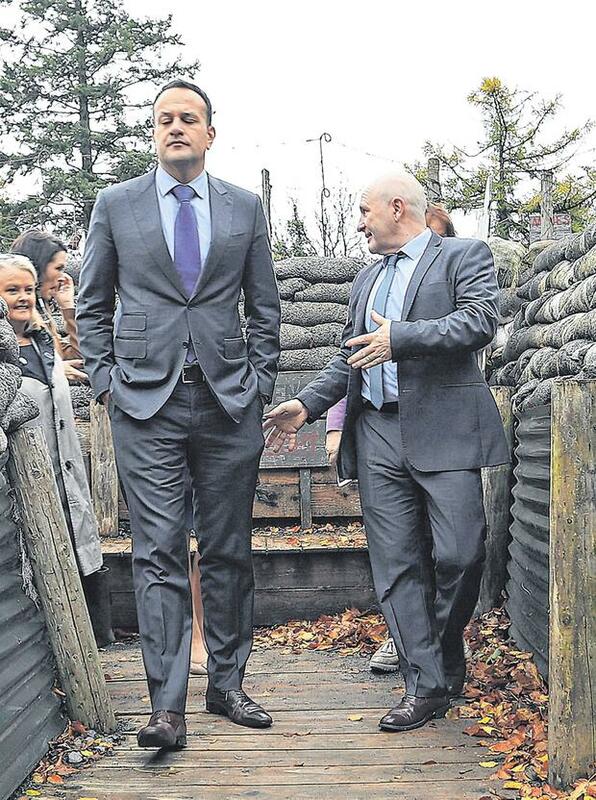 This time the Fianna Fáil leader was seeking to buy a chunk of time and also calm things down. In his letter Mr Martin urges the Taoiseach to agree that no election be called, whatever the outcome of their talks on the future of confidence and supply, until the legislation to underpin Budget 2019 in enacted, and Brexit is sorted out. That would mean an EU-UK Brexit deal being agreed - and then ratified by the UK and European parliaments. The first half of the Brexit thing is now looking quite likely; the EU has a long history of doing deals in a culture which is part of its very raison d'etre. But whether Theresa May can get ratification looks far less assured and also could take time, maybe even into 2019. There were some in Fine Gael who felt a good vibe from a whole series of EU meetings and summits in the coming weeks could facilitate Mr Varadkar going to the polls. There has been intense talk in Leinster House around this "November or December" scenario for weeks now. But much of this Fine Gael hawkishness was based on a solid year of opinion polls showing it 10 points clear of Fianna Fáil. Now another Red C poll, this time for Paddy Power bookmakers, has cut Fine Gael's lead to 5pc. It is just one poll - but it offers encouragement to Fianna Fáil, who will say: "Take another three points off that one and we're leading." Broadband failures over the last seven years of Fine Gael-led governments might be a rich seam for Fianna Fáil to mine in the forthcoming general election. It might yield more votes than housing and health problems for which it is deemed by some to be complicit. More disturbing news this week, including Emma Mhic Mhathúna's funeral and the Charleton Tribunal findings, remind us of the real work to be done. An election yielding a government with a clear majority would be a boon.